Until the 7th December 1941, Malaya and Singapore were outposts of the British Empire, known mainly for tin mines rubber and tea plantantions and a relaxed tropical life style associated with the "The Raj" - Britain's colonial far eastern grouping of countries stretching from Pakistan to Singapore. Singapore was recognised for its strategic value dominating the Straits of Malacca and the trade routes through the Dutch East Indies, and British plans for the security of the region were focussed on 'Fortress Singapore' with massive coastal artillery guns pointing out to sea, the direction from which any threat was presumed to come, and a major naval base to be constructed there. Japan had been identified as a potential threat, given its war in China that it had been waging since 1931 and its more recent 'accommodation' with the Vichy French in French Indo-China. Meanwhile, war raged in Europe. Australia raised four Divisions as part of the 2nd AIF; the 6th, 7th 8th and 9th. All except the 8th had deployed to the Middle East in 1940. The 8th was sent to Singapore to bolster British Forces there and protect the as-yet unbuilt Singapore Naval base that was supposed to provide an umbrella for interests in SE Asia and by extension, Australia. Japan was seen as a looming threat following its joining the Axis power bloc. The Japanese launched concurrent attacks at Pearl Harbour, Clark Field Manilla in the Philippines and at Kota Baru on Malaya's north east coast on 7 December 1941. The British forces under Lieutenant General Percival, struggled to mount a coherent defence from the outset, relinquishing air and naval superiority in quick succession. 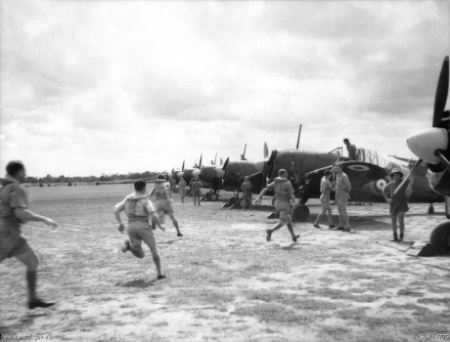 The RAF and RAAF's presence in Malaya was quickly overwhelmed with survivng aircraft and personnel attempting to escape the onslaught to Singapore. The Royal Navy suffered the catastrophic loss of two capital ships on which the defence of Malaya and Singapore supposedly depended. When HMS Prince of Wales and Repulse were sent to the bottom by Japanese aircraft, it signalled both the pre-emminece of airpower, and the end of a flawed strategy that sent shock waves through the British Empire, most particularly in Australia. "Fortress Singapore's" defences were based on coastal artillery pointing out to sea, yet the threat manifest very definitely as ground attack from the landward side. The British and Commonwealth ground forces were outclassed and outfought by the numerically inferior Japanese invaders who were, however, combat hardened troops. The Allies were not prepared or adequately coordinated and were often by-passed or cut off by aggressive Japanese probing of defences. The Allies tended to hug the main roads whereas the Japanese were adept at encircling and bypassing tactics using the jungle terrain far more effectively than their opponents. Rumours quickly circulated of massacres of captured Allied personnel by the Japanese. Allied forces did conduct some very effective actions notably at the Muar River and Gemas, but these were the exceptions rather than the rule. All three services were involved in this campaign, RAAF and RAN almost from the outset. Australian ground troops had not entered the fray immediately. When they did, their fortunes were mixed. RAAF - On 9 December, Nos 1,2 8, 21 and 453 Squadrons were pressed hard from the outset. Hudson bombers of Nos 1 and 8 Squadrons RAAF bombed enemy positions, and had sunk the first Japanese ship of the war off Kota Bahru, before withdrawing to the south via Butterworth (1). Nos 21 and 453 Squadrons RAAF flying obsolete Brewster Buffalo fighters were hopelessly outclassed by Japanese 'Zero' fighters, and were progressively reduced to ineffectiveness. RAN - HMAS Vampire was the first Australian ship in action against the Japanese 8-10 December when she alerted 'Z' force to the presenced of Japanese reconnaissance aircraft in their vicinity, preceding the loss of HMS Repulse and HMS Prince of Wales when they were were sunk. Vampire and the other escorting destroyers were able to rescue over 2000 survivors from the two capital ships. (2) On 27 January, HMAS Vampire took part in an attack on a superior Japanese surface force off Endau on the east coast in comapny with HMS Thanet. The British ship was lost during the battle and HMAS Vampire only narrowly escaped being sunk. The Australian corvettes endured many air attacks escorting incoming convoys to Singapore. Army - 8th Division. On 14-15 January 1942 a company of the 2/30th Battalion, commanded by Lieutenant-Colonel Frederick Galleghan, mounted an ambush which killed hundreds of Japanese bicycle troops at a bridge on the Sungei Gemencheh river near Gemas. Unfortunately maximum effect was not achieved because artillery fire that was to have been called in when the bridge in the centre of the killing ground was destroyed, did not occur becasue of a failure of communication. On the afternoon of 15 January the Japanese had repaired the bridge and began testing the 2nd/30th's perimeter some 3km further along the road, and called in aircraft and tanks. In a brief and furious action, two anti tank guns of the 4th Anti Tank Regiment and mortar fire destroyed or disabled a total of three echelons of light and medium tanks ranged against them to lead the attack on the 2nd/30th Battalion position. The 2nd/30th then began the business of extracting itself. The net effect though was a resounding success. The Japanese sustained some 6-700 or so soldiers killed (3) in the first major set back of their campaign. Further west near the coast, on 15 January 1942, two battalions from the 8th Australian Division were despatched as reinforcements to the 45th Indian Brigade on the west coast, defending the line of the Muar River. On the 18th January the 2/29th and the 2/19th Battalions engaged the veteran Japanese Imperial Guards Division, as the Indian brigade was pushed back towards Bakri where, north of the village, the 2/29th and once again the gunners of the 4th Anti-Tank Regiment (including the crews who had done the damage at Gemas) ambushed the road in a cutting through which any Japanese advance would come. A total of eight tanks were destroyed in a ferocious shoot out with the 2 pounder anti tank guns. However, success was short lived. The 45th Indian Brigade's Headquarters was effectively destroyed in an air raid and the newly appointed Lieutenant-Colonel Charles Anderson, Commanding Officer of the 2/19th Battalion, took command of all troops and decided to withdraw towards Parit Sulong. The Australians became heavily engaged front and rear so on 20 January they began fighting their way south through Japanese positions. Anderson's men attacked to re-open their escape route, and gained the village of Parit Sulong, but were in a untenable situation. With many of the Australian and Indian troops killed or wounded, and a British relief force blocked by the Japanese to the south, Anderson was forced to order his men to escape in small parties through the countryside, leaving the wounded behind. The Japanese massacred them in a most depraved manner setting fire to their remains. (4) Less than a quarter of the Australians at the start of the battle - escaped, eventually withdrawing to Singapore where they were reinforced. For his valour and leadership, Lieutenant-Colonel Anderson was awarded the Victoria Cross. 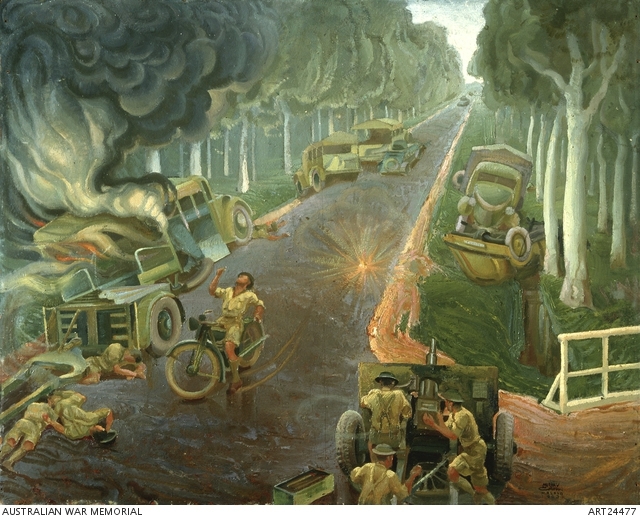 On the east coast, on the night of 26-27 January, the Australian 2nd/18th Battalion supported by the 2nd/10th Field Regiment successfully conducted an ambush at Jemaluang, near Mersing. It was initiated in darkness, rather than in daylight as had been intended. The CO, Lieutenant Colonel Varley, was ordered to withdraw after first light. However, the Australian action bluntd the Japanese advance and they dod not occupy the area until the 29th force such was the impact of the losses inflicted on them. However, a timetable for withdrawal had been established, so by 30 January 1942, the Japanese XXV Army had advanced to southern tip of Malaya across the straits of Johor from Singapore island. The weary British, Australian and Indian troops made their way over the Causeway to Singapore Island and on 1 February, after the last man had crossed, engineers blew up sections of the Causeway to isolate the island. A relentless air attack of the island began and when its water supply was cut off, the defenders were doomed. When the Japanese eventually mounted an amphibious attack by night, on evening of the 8th/9th February the defences began to crumble due to failures of command control and communications. Heavy casualties were inflicted on the Japanese in some sectors but once they got ashore and with superior artillery and air support, the result was inevitable. General Percival surrendered his force on the 15th February; a British and Allied force of 90,000 had been defeated by a Japanese force of just 35,000. Australia had lost nearly a quarter of its 2nd AIF. Most of the 8th Division had been lost; the rest woud be swept up across the islands to the east in the subsequent weeks. Much worse was to come with three and a half years of brutal captivity in front of them. This article draws on a range of sources including a recent definitive book "Descent Into Hell" by Peter Brune, which examines this campaign and it aftermath in the prison camps in great detail and is recommended reading for anyone interested in this very dark chapter of Australian Military History. (less 23rd Brigade which was scattered through the Indonesian archipelago east to New Britain with some elements of some of the units below - comprising the 2nd/21st Battalion 'Gull Force' Ambon, 2nd/22nd Battalion 'Lark Force' Rabaul, and the 2nd/40th Battalion 'Sparrow Force' Timor.